JosephPriestley is a Legacy Library. Legacy libraries are the personal libraries of famous readers, entered by LibraryThing members from the Legacy Libraries group. 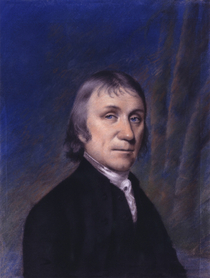 » Joseph Priestley's legacy profile. JosephPriestley is also an author. » See Joseph Priestley's author page. About meJoseph Priestley (13 March 1733 - 6 February 1804), English polymath (being a renowned educator, theologian, political philosopher, scientist, &c. &c.). Priestley is perhaps best known today for the 'discovery' of oxygen (he also figured out how to make soda water), but during his own time was famous for his tolerationist views when it came to religion (he was an original founder of Unitarianism in England), his radical political opinions (a supporter of the French Revolution, he fled England for America in 1794, not long after his house was torched by a mob) and for his works in the fields of education and historiography. He was the author of more than 150 published works (list) during his lifetime. A devoted student of languages (along with so much else), Priestley learned French, Italian, German, Chaldean, Syriac and Arabic. Priestley's friends included Thomas Jefferson, John Adams, and Benjamin Franklin, among many other leading luminaries of the day. About my libraryPriestley's library as included here is that listed in Catalogue of the Library of the late Dr. Joseph Priestley, containing Many scarce and valuable Books (Philadelphia: Thomas Dobson, 1816). The collection was sold off by Dobson after Priestley's death; Thomas Jefferson purchased several of the books for his own library. As several of the books included in the Catalogue were published after Priestley's death, it is evident that at least a few titles were added posthumously. Those titles are not included here. "This mark * denotes that the binding is injured. cf. denotes calf binding; - vell. vellum; - hf. bd. half binding; - bds. in boards; - sd. sewed. Where there is no mark, it is to be understood that the binding is plain. Where the place of publication is not mentioned, it is to be understood that the work was printed in London." Priestley's catalogue is separated into three large sections: Religion; Mathematics, Philosophy, &c. &c.; and Miscellaneous. Those headings have been retained as the primary tags, with additional tags added as appropriate. Within each section the books are organized (loosely) alphabetically. A note at the end of the Catalogue reads: "Owing to the haste with which this Catalogue was prepared for the press, several errors in the arrangement, as well as in other respects, have doubtless been overlooked, which, it is hoped, the reader will excuse." Priestley wrote that the book which most influenced his life, aside from the Bible, was David Hartley's Observations on Man (1749).